Postscript Feb 4th 2019 - See a peer reviewed academic article on the IDD method by Sutton and Griffiths: (here). 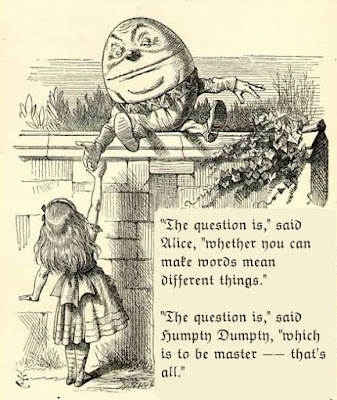 One particularly entertaining example, but nevertheless an important one because it superbly demonstrates the power and multidisciplinary application of the method to solve long-standing historical problems, is what the IDD Big Data research method (Sutton 2014) revealed about the etymological origin of the naming of the nursery rhyme character Humpty Dumpty. This was a great etymological mystery dating back to the 19th century. The online Oxford English Dictionary (OED) (2012) notes an alcoholic beverage named ‘Humtie Dumtie’ is noted in published print dated 1698. However,unevidenced claims abound to explain the alleged literary influence for the original 18th century nursery rhyme character that came to be represented 74 years later in Lewis Carroll’s (1871) Alice Through the Looking Glass. Dutra, (2005. P. 165) and Foster (2008) for example, claim on the basis of no independently verifiable evidence whatsoever, that the name for and natural wall-sitting habitats of this character originate from ‘Humpty Dumpty’ being a Royalist forces cannon that fell off a wall in the English Civil War. With Back and Breast like Punchanello." IDD revealed also the observation by Pepys (1665) of a Parliamentary forces cannon named Punchinello. That finding triangulates the significance of the Punchanello-Humpty-Dumpty discovery by neatly debunking the un-evidenced Royalist cannon myth and providing a most compelling clue to explain its obscure origins (see Sutton 2014a). This discovery shows that the IDD method, even in the hands of the amateur, is a myth-busting research tool, which on occasion performs better than etymology and cultural history experts informing the OED and other renowned sources. Simply having the power to date and Boolean search in one go within tens of millions of documents enables sociological, historical and etymological myths to be bust and entrenched problems solved. Anonymous (1701) A rod for Tunbridge beaus, bundl'd up at the request of the Tunbridge Ladies. To Jerk Fools into more Wit and Clowns onto more Manners. A Burlesque Poem. London. Carroll, L. (1871) Through the Looking-Glass, and What Alice Found There. Macmillan. Dutra, S. (2005) Cavity Quantum Electrodynamics: The Strange Theory of Light in a Box. New Jersey. John Wiley. Foster, S. (2008) Hey Diddle-Diddle: Our Best-Loved Nursery Rhymes and What They Really Mean. Chichester. Summerdale Publishers. Pepys, S. (1665) The Diary of Samuel Pepys, Volume 2. Random House. New York.